Introducing new Gold Standard 100% Whey Limited Edition White Chocolate Raspberry flavour with real fruit pieces. Optimum Nutrition’s Gold Standard 100% Whey is the world’s best-selling whey protein. It delivers 24 g of whey protein to support muscle growth. After training, your body uses protein to help repair and rebuild muscle fibres. Each great tasting serving contains 24 g of premium whey protein to support muscle growth and 5.5 g of naturally occurring BCAAs. All with just 1.3 g of fat, 0.8 g of sugars, and with 1.1 g of carbs. Gold Standard 100% Whey is best enjoyed first thing in the morning and/or during the 30 minutes just before or immediately after training. Protein Blend (Whey Protein Isolate (Milk), Whey Protein Concentrate (Milk), Hydrolysed Whey Protein Isolate (Milk), Emulsifier: Soy Lecithin), Freeze-Dried Raspberry Pieces (1.0%), Flavouring, Sweeteners (Sucralose, Acesulfame K). 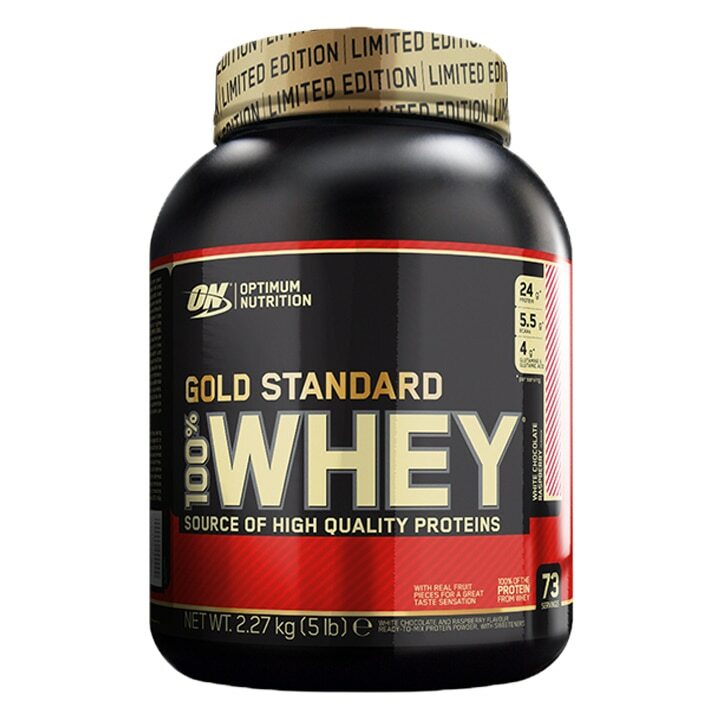 Optimum Nutrition Gold Standard 100% Whey Powder White Chocolate & Raspberry is rated 4.8 out of 5 by 40.